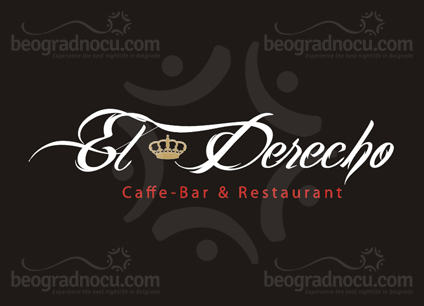 Restaurant El Derecho is your right for best things, because this oasis of heavenly hedonism in imaginative hands of cashmere is located at No 67 Bulevar Kralja Aleksandra Street - place where you can touch the sky. Whenever you visit restaurant El Derecho you can enjoy in this beautiful kingdom from 8 am to 12 am. This restaurant accommodates 200 people. Restaurant El Derecho breaks all barriers and prejudices that we are far away from restaurants world wide in hospitality and top service. Soul of the world is hidden in restaurant El Derecho which awakes every time you have something important to celebrate you can do it in beautiful restaurant El Derecho. In front of you in restaurant El Derecho opens up another side of beauty of the world - with large selection of alcoholic and nonalcoholic drinks , as well as delicious menu: ''English breakfast'', ''Omelet made by your taste'', specialties with chicken, beef, veal, than Mediterranean cuisine: pastas, risottos, salads... Fresh juices, most quality wines from Serbia and Mediterranean, large selection of cocktails and house specialties. You well fell like you belong here, in this sophisticated, moderate and unusual world that illuminates from restaurant El Derecho: true revelation in hospitality world in Belgrade. In restaurant El Derecho, everything is superbly designed and a lot of effort is put into decoration with lot of imagination and creation. In restaurant El Derecho you can feel true artistic hand ready to inspire you. Restaurant El Derecho is like a dream you are dreaming awake and ideal for all moments you want to remember: weddings, birthdays parties, celebrations, but also ideal for business meetings. In restaurant El Derecho is ideal and very pleasant for any conversation, interior is phenomenal for cocktail night that have become tradition in restaurant El Derecho in Belgrade. This is a place where you can find yourself and discover your hidden preferences in this divine and sophisticated restaurant. Earst colors are prevailing in restaurant El Derecho with wooden and stone elements. Lounge and garden are equipped with three flat screen TVs and one large video screen also in garden. Luxury booths made of wood and stone, separate smoking area, pleasant escape for little break from daily rush. Restaurant El Derecho is to treat yourself with only the best, beacuse El Derecho is the best and you deserve it.